India A 4-261 (Robin Uthappa 103, Unmukt Chand 94, Adam Milne 3-43) beat Neaw Zealand A 257 (Daryl Mitchell 51, Anton Devcich 48, Dhawal Kulkarni 3-38, Ashok Menaria 3-43) by six wickets. An all round performance by India A well led by their two top order batsmen, Robin Uthappa along with his skipper, Unmukt Chand, let New Zealand A down at ease. The Kiwi’s A were bowled out for 257 with two balls remaining in the allotted 50 overs and the Blue Shirts A hammered 261 for the loss of just four wickets in 44.1 overs. The first unofficial One Day International of the three match series was played on Sunday, September 8, 2013, at VDCA Cricket Stadium, Visakhapatnam. Earlier, Andrew Ellis, captain of the New Zealand A, won the toss and preferred to bat on a good looking pitch. Anton Devcich along with Luke Ronchi started off reasonably well by scoring 34 in 8 overs with 3 fours from the first. 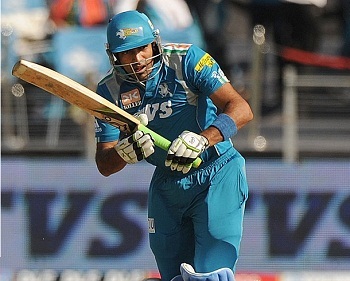 Ronchi was caught by Robin Uthappa off Shrikant Wagh at 36 at his personal feat of 13. Carl Cachopa walked in next as Devcich hit 4 fours in the following overs and kept the score board moving. The second wicket fell at 87 in 17.3 0vers when Anton Devcich was gone for 48 off 47 balls with 7 fours. Tom Lathan appeared in the park next as Cachopa hit the first six of the innings in the 20th over. Latham got the same result in the next one and they added a 12 runs in the 23rd over with 1 six and 1 four. Carl Cachopa was clean bowled by Ashok Menaria for 45 off 47 with 2 lofty sixes and 3 fours as the score touched 135 from 24.2 overs. Latham became the sixth victim at 159 after scoring 37 as Daryl Mitchell took charge of the situation and the late order batting of the visitors revolved around him. He shared a few partnerships and finally lost his wicket for 51 off 62 with 2 big sixes and 3 fours. The entire New Zealand A team was sent back to the pavilion for 257 in 49.4 overs. 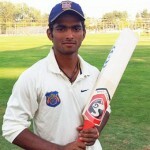 Dhawal Kulkarni, Rahul Sharma and Ashok Menaria were the top wicket takers with three each whereas Shrikant Wagh got one. Robin Uthappa and Unmukt Chand started the chase bravely by scoring 48 runs in the first 10 overs. Uthappa was the most aggressive of the two and hit 6 fours whereas Chand got 2 in the 11th one followed by 1 six in the 13th over. The duo was scoring runs freely as Uthappa tasted his first six in the 17th one and reached his fifty on the first ball of the next over with another four. The pair accumulate 3 sixes in the coming overs as Unmukt Chand attained his 7th List A fifty in the 22nd over. He dispatched 16 runs in the next one with 2 high sixes and 1 four and gathered another 4 fours and 1 six in the next few overs. The mammoth first wicket stand was broken at 178 when Unmukt Chand was caught by Tom Latham at midwicket off Anton Devcich for 94 from just 88 deliveries with 6 spicy sixes and 9 fours. Aditya Tare got together with Uthappa who hit two back to back sixes in the 31st over and the score went past the 200 runs mark three overs later. Robin Uthappa was dropped at 93 but he utilized the golden chance and plundered his 26th List A century with a six. He was finally caught by Colin Munro off Adam Milne for 103 from 114 comprising 5 sizzling sixes and 8 fours. Aditya Tare remained unbeaten for 37 off 42 balls with 2 sixes and 3 fours as the Men in Blue A achieved the target by piling up 4-261with 23 deliveries to spare. Adam Milne was the most successful bowler with three wickets whereas Anton Devcich held one. India A clinched the opening unofficial One Day International against New Zealand A by a huge margin of six wickets and leads the three game series 1-0.The second encounter of the series will be held at the same venue on September 10, 2013.